From Kraft Foods Magazine (which readers must now pay for, when this magazine used to be free)…Maple-glazed stuffed roast pork. I had purchased what I THOUGHT to be a pork roast, however, turned out to be two small pork loins netted together. Doug placed the stuffing in between the two loins, tied with butcher’s twine and cooked on the Big Green Egg for about 90 minutes or so…it was awesome! Heat oven or Big Green Egg to 350º. Melt butter in a large skillet on medium heat. Add apples; cook and stir for three minutes or until crisp-tender. Add water and stuffing mix; cover. Let stand 5 minutes, then mix lightly. Spoon stuffing mixture onto cut side of meat to within 1/2″ of the edge; or, place stuffing in between loins. Roll up or tie together with butcher’s twine. Secure, seam side down, in a shallow roasting pan, that has sprayed with cooking spray. Bake for 1 hour. Mix syrup, mustard and rosemary in a small bowl. Spread over meat. Bake an additional 20-30 minutes, or until internal meat temperature is 160ºF. Remove from roasting pan, let stand, gently tented with foil for about 15 minutes. Slice and serve. 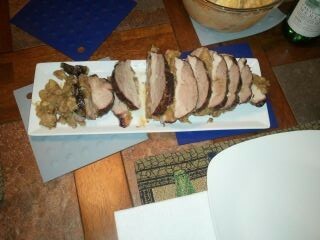 We had a small amount of excess stuffing, served on the side.